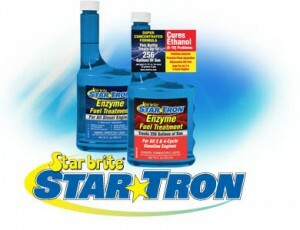 StarTron is a groundbreaking multi-functional fuel additive based on advanced enzyme technology. StarTron’s enzymes are bio-catalysts derived from plants, not dangerous chemicals. The enzymes in StarTron cure all the problems caused by todays ethanol blende and environmentally friendly fuels; both gasoline and diesel. The enzymes break down large fuel clusters to nano size for a more complete combustion! This means improved power, less soot and better economy! Fuel remains stabilized for up to 2 years, and the fuel remains water free, preventing the growth of microorganisms. For more information visit www.startron.com and please watch the video! StarTron is officially distributed by Snappy Europe in Sweden, Norway, Denmark and Germany and is sold in these countries by Watski. Snappy won laboratory testStarTron test in Husbilen Nr 5, 2012.